Forest Hill Australian Labradoodles is a family breeder. The dogs in our program are all in our home. Some sleep with us in bed while some prefer the friendly confines of the puppy palace. The dogs live with us (with a bengal cat named Honey) and are well socialized with humans and animals. Forest Hill Australian Labradoodles believes in responsible breeding. 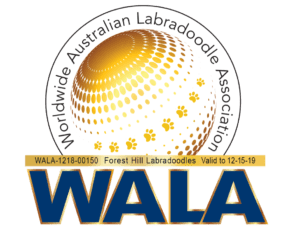 That is why we are members of the Australian Labradoodle Association of America (ALAA-004275) and the Australian Labradoodle Club of America (ALCA #264). Our doods go home with a strict neuter/spay policy. We do this to continue responsible breeding. Forest Hill Australian Labradoodles utilizes a socialization technique called Puppy Culture. It is the gold standard in socialization. 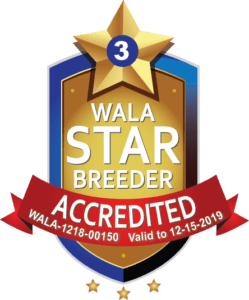 It provides early neurological stimulation to assist us in whelping litters that are socialized and ready for the world. Our dogs are located across the United States and Canada. Some of our dogs are companion dogs as well as therapy dogs and each one holds a special place in our heart. Our dogs have gone to families who have lost loved ones at war, cancer patients who read our story and wanted a piece of our strength and elderly families that needed a companion. Each of these circumstances are unique and we are happy to provide a dog to those in need. These dogs saved us and we are happy to pay it forward! 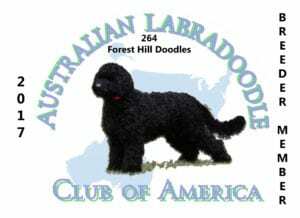 We hope you choose Forest Hill Australian Labradoodles as your partner in canine acquisition! It is a big step so feel free to ask questions because these are living animals and they deserve to be cared for properly.